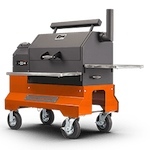 Just received my new Yoder Smokers YS640 on orange competition cart the other week and I LOVE it! Made some beef short ribs and a brisket so far and each turned out great! I was a little hesitant on spending that much $$ on a smoker but in the end I'm glad I did. It's a very well made product and should last for years. Welcome! I've had mine for a few months now, the only issue I have is ..... Why did I wait so long to get one!